It’s a new season, but the intense rivalry remains unchanged. The teams are tied for second in the West Division heading into the tilt, so the Riggers are expecting an all-out war. “This will be a big statement game for us,” said defender Mitch Wilde. “We’re both at .500, it’s big divisional game, and we haven’t seen them yet this year. We always have a great scrap against them every year so I think this game overall will be a big test for us physically and mentally. A race in the standings is not the Rigger’s only source of motivation against the Rush, though. They’ll also be looking for their first win against their western rivals since April 2017. “It’s just motivation to strive to be better, knowing they’ve had our number for the past couple of years,” Wilde said. “These games are ones you look forward to because they’ve had your number and you feel like you have something to prove as a team. The Riggers head into the game riding high after an 8-5 season-series clinching victory over the Vancouver Warriors at home on Feb. 2. This weekend, they hope to put forth the same winning effort. “It stopped a three-game skid,” said Roughnecks GM Mike Board. “We got back to what we wanted to do defensively, we had good goaltending and we put enough balls in the net to get the win. 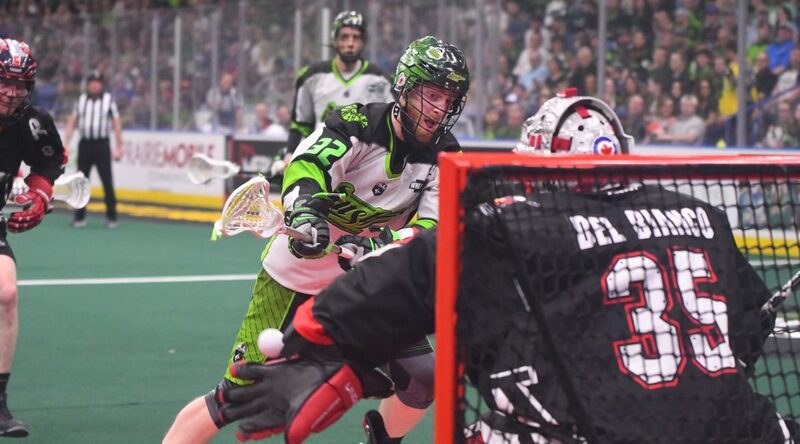 On the other side of the turf, the Rush are looking to snap a two-game losing skid – most recently falling to the Toronto Rock 16-13 at the Scotiabank Arena Feb. 1. But despite the Rush’s recent adversities, there’s no question the Roughnecks will have their hands full with the stacked roster they’re up against – which includes names such as Mark Matthews, Ben McIntsoh, Jeff Shattler, Jeremey Thompson and Robert Church. “The Rush are the Rush,” Board said. “They’re going to come at you hard on offence, they’ve got a lot of offensive weapons. They run the ball well, and they’ve got a very good defence.